- For the first time in four years, AMD has taken control of the discrete graphics market from Nvidia, with 51.1% market share, up 10.4 points from Q2 2009. In that same period, Nvidia lost 10.4 points. - In the lucrative Desktop discrete market, AMD gained 11 points in the year, standing at 44.5% market share. This was a direct loss for Nvidia, who fell 10.9 points in the same period. - In the fast growing mobile discrete market, AMD gained another 2.4 points, now standing at 56.3% market share. Ok now you can see that this e-mail is sort of confusing. After all the time when people were condemning AMD’s purchase of ATi is long past. We have much newer and more interesting things to talk about now. So why bring that up at this time? The two bullet points (as we have already mentioned) are informative but still contain quite a bit of PR spin. The last paragraph contained the most interesting parts. After talking up AMD’s strategy they stuck in a jab at NV that was not really needed if this e-mail was really about AMD’s strategy (in buying ATi) working out. With this in mind I can up with a series of questions I wanted to ask. As we said we wanted to talk to AMD about this so we arranged a call with David Erskine from AMD to ask our questions. I have paraphrased David’s comments and added my commentary in italics after each answer. - What do you feel is the single biggest factor for the return to market share leadership? David’s answer surprised us. It was one word; Execution. As we mentioned in our last article on this topic we felt that AMD’s rapid return was more about AMD getting a DX11 solution to market while nVidia failed to meet its own goals and deadlines. David reminded us that AMD was able to launch and entire family of DX11 GPUs before nVidia’s first product hit the market. To put it simply; AMD executed, nVidia did not. - Do you feel that DX11 is being properly utilized or will we see a repeat of DX10? This question was important as DX11 was and still is one of the major features for the HD5xxx series GPUs. David explained that right now we are seeing a form of early adopter. As such they are getting in DX11 features in a small manner to enhance current game engines etc. (Just the easy parts). But now that DX11 is out and Windows 7 (plus DX11) is more widely accepted we will begin to see games that use more of the API. - Will this increase in revenue and market share allow AMD to return to assisting game development? David’s answer on this one was not surprising. He told us that as of right now most DX11 titles are being developed on AMD hardware (not a big shock as they are more prevalent). David also related to us that there is a good deal of interest from game developers in working more directly with AMD. He also noted that there would be more games coming in the future that will have more direct AMD support. DX11 development needs to improve over what we are seeing now, as it stands we are really only getting a handful of features in our games. If AMD can return to more direct support of development it is possible that we will indeed see more and more parts of the DX11 API included in our next generation games. If so then the much larger family of AMD GPUs can continue to gain ground in the market. - Will AMD return to developing for GPU based computing and physics? When I asked this question I mentioned the original display of physics running on an ATi X19xx GPU and that after this ATi/AMD seemed to disappear off the GPU based physics map. David stated that AMD has never left the physics playing field and remain committed to working on this part of the gaming puzzle. He said that AMD “wanted to do this right” and develop an API that was open and not proprietary. AMD wants to get developers the right tools to develop an open physics API that works with all GPUs and not just theirs. An open API is something that AMD has been pushing for a while. They have had a few minor demonstrations of this but nothing that has reached the consumer market. With nVidia pushing PhysX and their new GPUs having more power to execute this in tandem with their primary rendering job it is important to get this ball rolling for AMD. - In the e-mail that was sent there was a comment saying that Fusion was one of the reasons for the ATi purchase. Is there any truth in this? Here the answer sort of danced around the question. David commented that AMD was a CPU company while ATI was a chipset and GPU company. The blending of the two created a more diverse whole. Fusion was always on the map and has evolved as the pieces have evolved. While it was a consideration it was not apparently a major factor in the purchase. In reality the ATi purchase while understandable was poorly timed. AMD needed to compete directly with both nVidia and Intel. AMD had their own chipset development team but nothing like ATi, Intel or nVidia had at the time. By purchasing one they were able to gain two additional divisions to earn revenue off of. ATi’s GPUs, at the time, were competing very well against nVidia while their chipsets were beginning to gain traction. Unfortunately it has taken four years to get back to stable ground. In the time leading up to the 5xxx series GPUs AMD market confidence (in terms of GPUs CPUs are another matter entirely) suffered. Again if AMD had not been able to execute and get the 5xxx generation out early things might be very different. 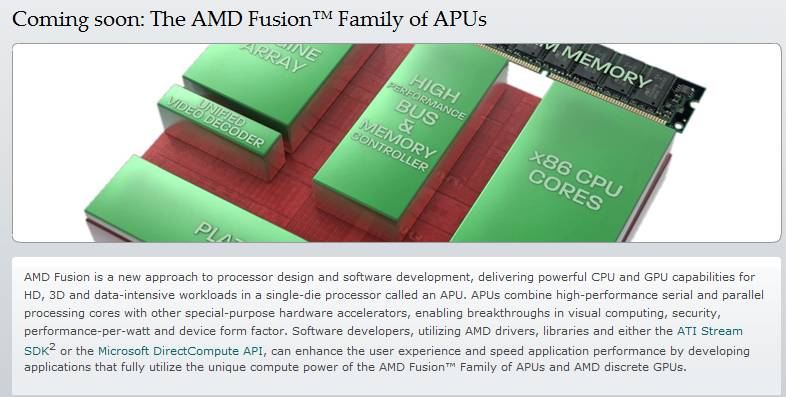 - Is Fusion a new direction at AMD? Will we see this CPU+GPU become AMD major push or will it stay in the entry level space? As you might expect David could not directly comment on much of what I asked. Fusion is not out yet and AMD’s plans for its future are probably not set in stone. David did state that Fusion addresses a need that AMD saw in the market for an energy efficient part in the mobile and entry level space. He did let us know that we can expect higher levels of performance in time. Fusion is an interesting concept. I am not sure where it really fits other than the basic All-in-One, entry level computing and the mobile market. I suppose that over time we will see this migrate to a more symbiotic part. However a CPU+GPU part that runs in concert will need an OS that can handle the task switching from CPU to GPU depending on demand and application need. Unless I am way off the mark I think this is the end state for Fusion; a small energy efficient CPU+GPU that can dynamically offload tasks to the part that can handle it best. This would allow for some simply amazing performance in the mobile and all-in-one market IF AMD can execute on the task to provide the proper tools to developers. As of right now, that execution is not there yet. What I gleaned from this conversation is that AMD is taking things in steps. The first step was to develop and market a competitive product. This step has been completed with the Radeon HD5xxx lineup. The market is still interested in these GPUs and buying them. AMD is a concerned about nVidia of course as they still have more money to influence the market. nVidia’s TWIMTBP program represents a multi-million dollar per year investment. It is one that AMD cannot compete with right now. However, that will change over time. As David mentioned AMD will be supporting titles in the future and will continue to work on their Open Physics platform. They just need to execute on this like they did on the 5xxx family. There is some talk that the current Vec5 design of the 5xxx GPUs is the thing that is preventing Stream and Open Physics from making a bigger impact that it is right now. After all to take advantage of Stream for physics or GPU computing your code has to be vecotrized. This requires good tools and takes more time to complete. After talking with a few game developers they have flatly said that the AMD tools are not there yet. They want and need more direct support from AMD to make these things work. Vectorized code is more efficient and in the end can have a smaller resource footprint making it desirable when developing game titles with extra features like Physics or GPU based AI etc. Of course all of this comes on the heels of the release of the GTX 460. This is a $200 GPU from nVidia that has some impressive performance numbers so far. With its highly parallel design and ability to execute both graphics and GPU compute tasks it represents a threat to AMD’s mid-range market space. AMD has one quarter; two at most, to get execute on development tools for in-game physics and other GPU based compute tasks. After that we may see the market share numbers shift back to nVidia’s side. I hope that AMD can execute on this and we see them become more involved in game design and development. It has been a very boring game market for the past four years. There are far too many DX9 titles and console ports out there for my liking. Maybe now we will see some good solid game titles that will take advantage of the DX11 API. AMD’s GPU division is in the right position; it is now up to them to actually do it.